A Country Dance. 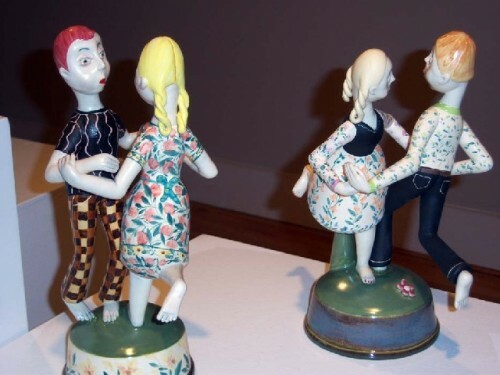 Ceramic sculptures by Gerit Grimm unless otherwise noted. Photos: Astrid Hiemer. 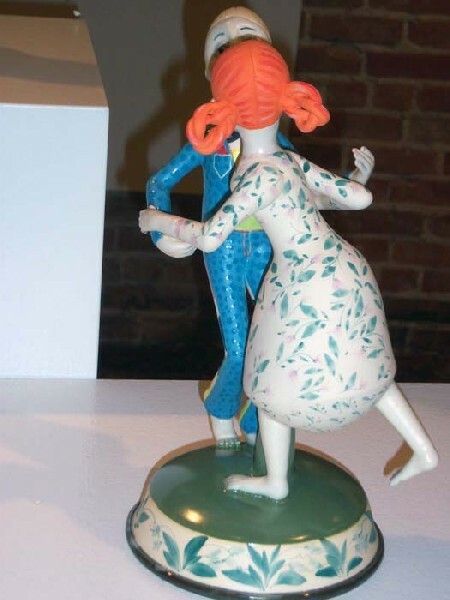 Country Dance: Karl & Ingrid, stoneware. Dreaming Head, wheel-thrown earthenware, and other pieces. Hostess: Coffee, Tea or Me. Gerit Grimm and Michael Boroniec. 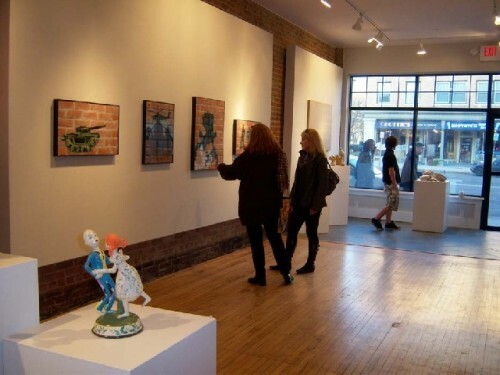 A view into the gallery. A series of war images. 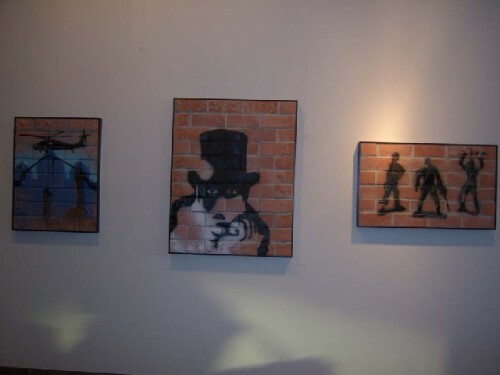 All following works by Micheal Boroniec. Desert Sand, earthenware and glaze. 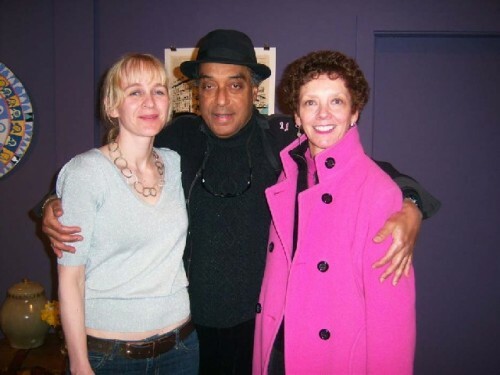 Gerit and friends: Robert Henriquez and Lisa Avery. 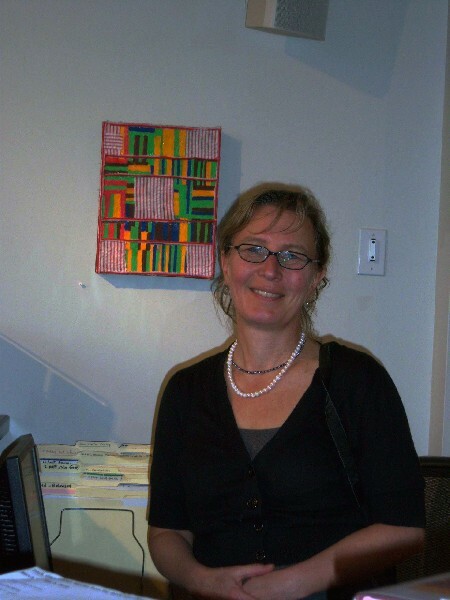 Leslie Ferrin at her gallery. 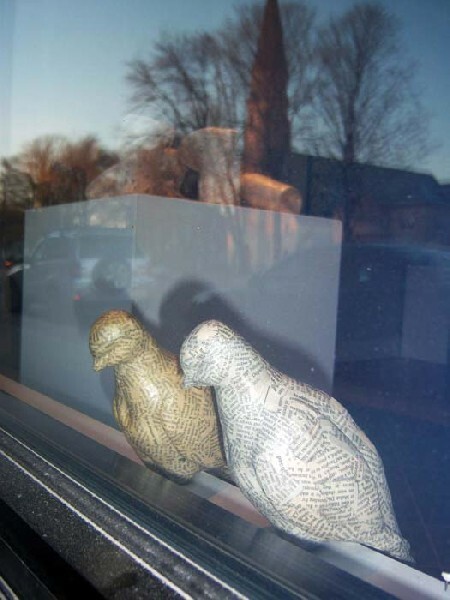 Suicide Doves placed near the gallery window. When we visited with Gerit Grimm at Project Art at the Cummington Studio in Massachusetts, where she was a resident artist, her ceramic sculptures were yet unfinished. 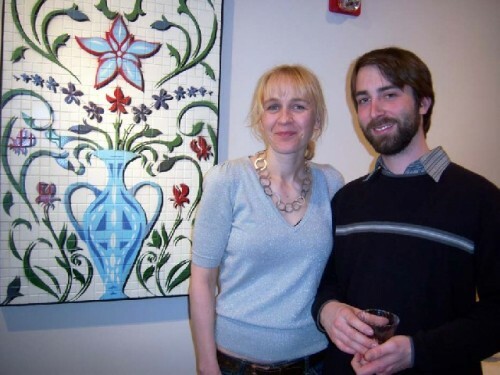 Grimm and Michael Boroniec are currently exhibiting selected pieces at Ferrin Gallery in Pittsfied, Massachusett, until April 24. 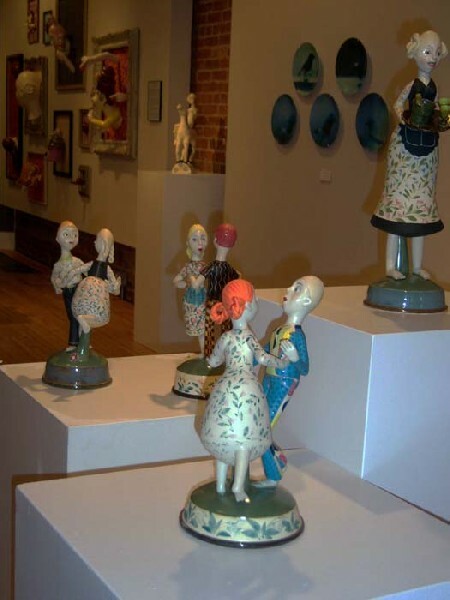 Then, Grimm’s sculptures had not been fully painted with flowers by invited potter/ceramic artist, Megan Hart, or received a color coating, done by Gerit, before the second firing process. 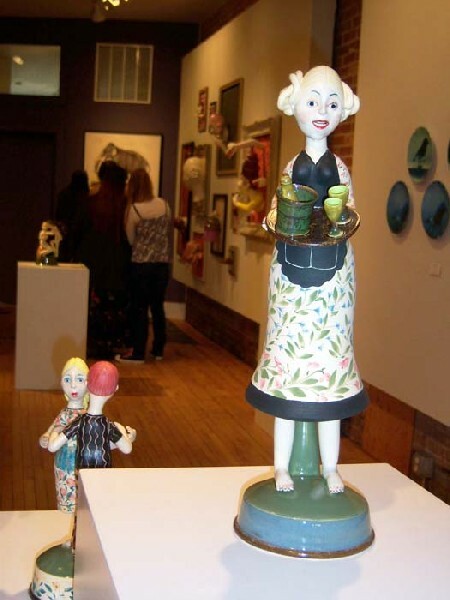 So, please compare the works in progress to the finished sculptures, and read our article on BFA: Gerit Grimm – a Whimsical Ceramic Sculptor. 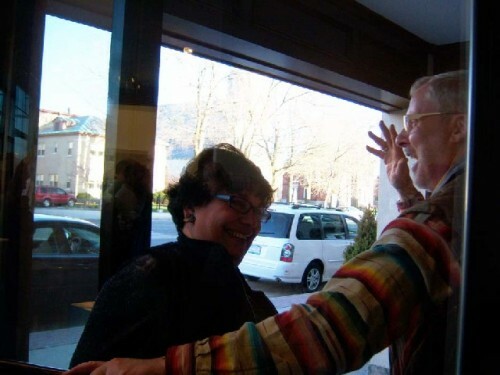 Ferrin Gallery stated the following about Michael Boroniec: A Berkshire native, lives and works in Pittsfield, teaching high school art by day and sculpting in ceramics, mixed media and printmaking by night. 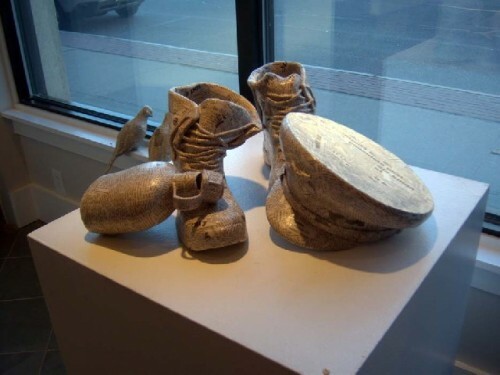 Michael Boroniec’s current series of sculptures was produced at Project Art in honor of his childhood friend, a West Point graduate, currently on his second tour of duty in Afghanistan. 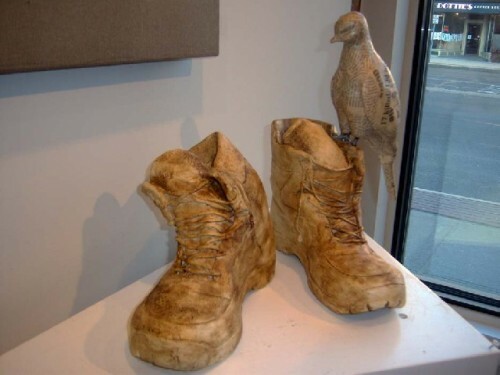 Using the opportunity to work in a new environment surrounded by other art professionals, Boroniec chose to re-objectify, in ceramic materials, the uniforms and equipment that will travel with Captain Russo into the war zone. 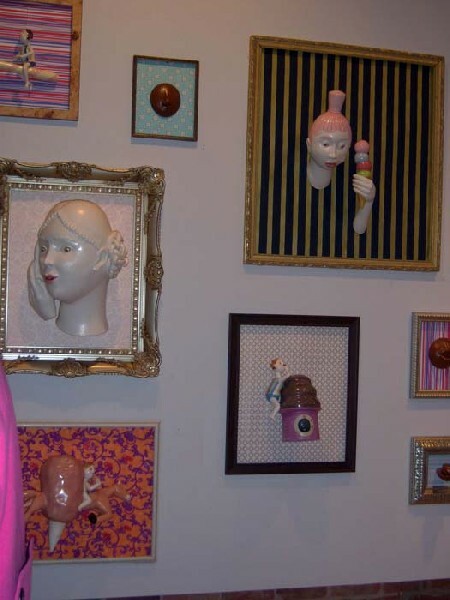 An ardent pacifist, this series builds on his interest to use his work to send a message.